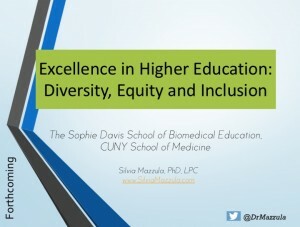 Dr. Mazzula is a counseling psychologist by training and educator with extensive experience in leadership, facilitation and training on issues of diversity, equity and inclusion. Dr. Mazzula provides strategic support, consultation and trainer-training enriched with over 15 years of research, clinical experiences and curriculum development attending to the psychological and practical role of race and culture in mental health and interpersonal/group dynamics. She specializes in developing process, benchmark measures and systemic guidelines to assess equitable, inclusive and culturally responsive research and scholarship and in social framework evaluation of workplace discrimination and inclusiveness. She is the Executive Director of the Latina Researchers Network, Former President of the Latino Psychological Association and member of the American Psychological Association and National Latina/o Psychological Association. Whether a Keynote, seminar or intensive hands-on training, Dr. Mazzula can individualize the program to meet your needs. A first-generation immigrant and college graduate, Dr. Mazzula had no idea what it meant to “succeed” in college, in graduate school, or even later, in the academy as a professor of Psychology. Now, an award-winning educator published author, and successfully funded researcher, Dr. Mazzula can speak to the challenges and opportunities to help motivate and empower your audience! Talk with Dr. Mazzula about your program needs! Expert and thought leader on individual and group dynamics and how these impact well-being, interpersonal interactions, teamwork, and decision-making. Let Dr. Mazzula take you to your next best level of self-awareness and critical self-reflection! Over 20 years combined experience supporting development and leadership of ethnic and racial minority students and faculty members across the country. “Latinas Breaking Glass Ceilings“, American Psychological Association 121st Annual Convention, Honolulu, HI. “A Latina Professor in Recovery: Challenges and Opportunities in Leadership”, National Leadership Conference and Convention. Houston, TX. 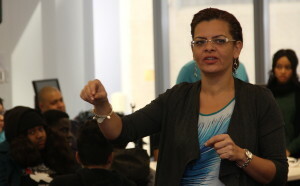 “Success in Higher Education”, EmPower Hour, Proud to be Latina, New York, NY. 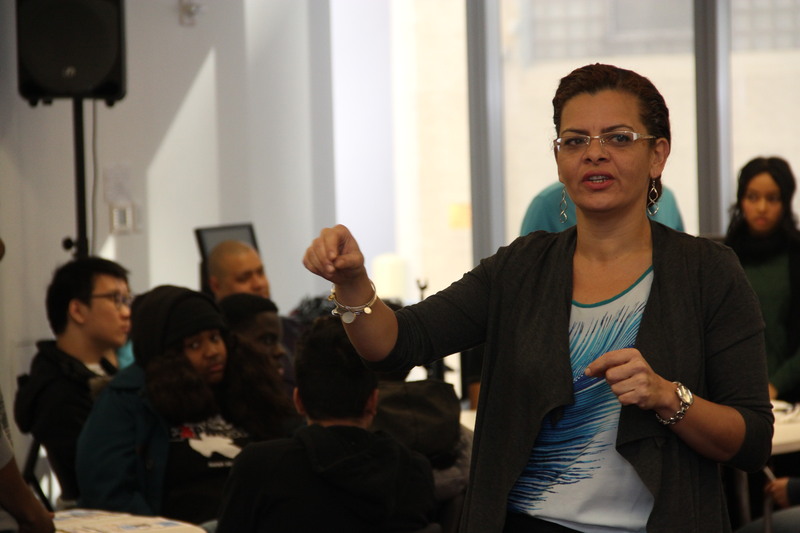 “From Rags to Re-Searcher: A Latina faculty speaks to her journey”, William Paterson University. Paterson, NJ. “Becoming a Psychologist”, McKinley Elementary School, Newark, NJ. 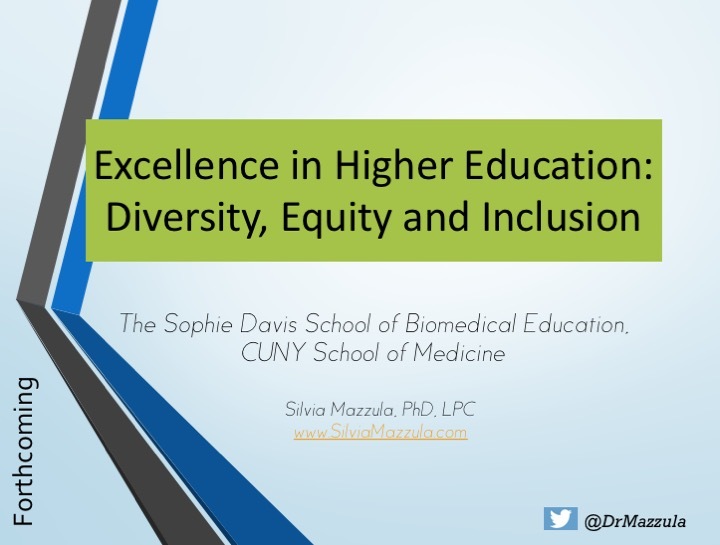 A Columbia University alum, Dr. Mazzula has extensive experience addressing diversity, equity and inclusion on individual, group and system levels. 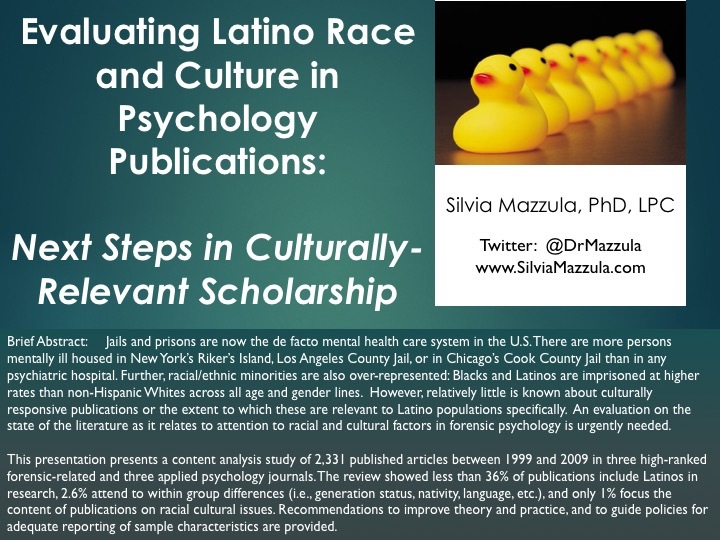 “Evaluating Latino Race and Culture in Psychology Publications: Next Steps in Culturally-Relevant Scholarship” , American Evaluation Association Conference, Chicago, IL. “Race and Culture in Psychology Publications: A Call to Action in Research, Theory and Practice”, American Psychological Association 121st Annual Convention, Honolulu, HI. 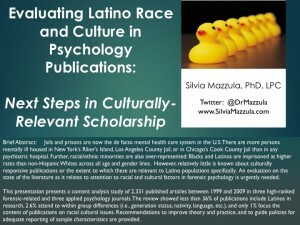 “Latino/a Racial and Cultural Issues in Forensic Psychology”, University of Miami, Miami, FL. 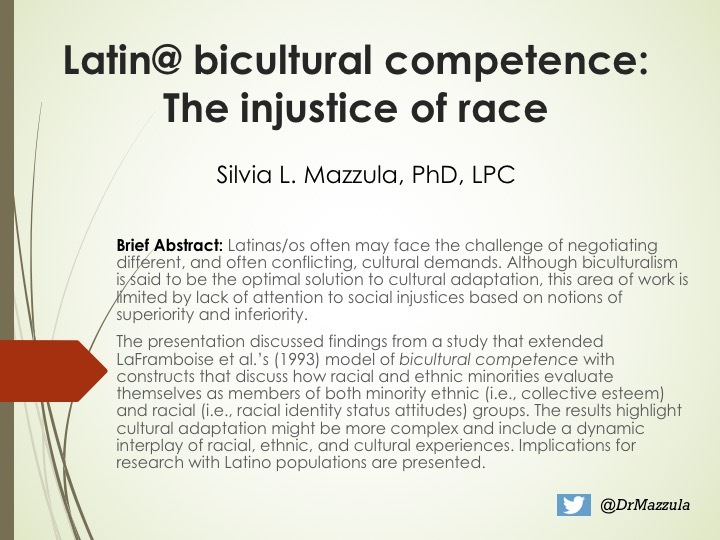 “Hispanic/Latino race and ethnicity in Counseling Psychology research: A 15-year review“, with Victoria, V., National Latino/a Psychological Association Biennial Conference, Costa Mesa, CA. As a trained scientist-practitioner, Dr. Mazzula has a keen eye on human development and behavior supported by years of clinical and research experience. “Latinos and Suicide: Where do we go from here?”, Pace University, New York, NY. “Latino/a cultural values orientation: Their concrete significance in clinical work”, Montclair State University, Montclair, NJ. “Transgenerational implications of parenting: Issues for community psychiatry”, New York-Presbyterian Hospital, New York, NY. “Latinas/os in White America: Finding a middle ground. The College of New Jersey, Trenton, NJ. “The Silent Killer: Finding balance and protection within a multicultural framework”, The College of New Jersey, Trenton, NJ. 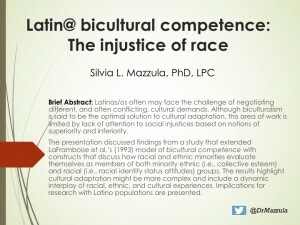 “Latina/o Experiences with Racial Microaggressions”, American Psychological Association 121st Annual Convention, Honolulu, HI. “Working with culturally sanctioned symptomontology” New York-Presbyterian Hospital, New York, NY. “Let’s talk about safety: A child sexual abuse prevention program”, University of Medicine and Dentistry of New Jersey, Newark, NJ. “Hablemos de la seguridad: Un programa para la prevención del abuso sexual infantil”, University of Medicine and Dentistry of New Jersey, Newark, NJ.